The global surface mount switch market is considered to be highly fragmented in nature and is likely to experience a high level of competition throughout the forecast period, states a research report by Transparency Market Research. In 2015, the prominent players operating in the global surface mount switch market, namely C&K Components, Omron Corporation, E-Switch Inc., NKK Switches Co. Ltd, and Grayhill Inc. held a share of 46% of the overall market. These players are estimated to maintain their dominance in the next few years, focusing on the expansion of their product portfolio, In addition to this, the increasing number of mergers and acquisitions and the growing emphasis on innovations are expected to benefit the leading players and encourage the growth of the market in the next few years. Furthermore, the rising research and development activities in this sector is projected to accelerate the growth of the market in the near future. 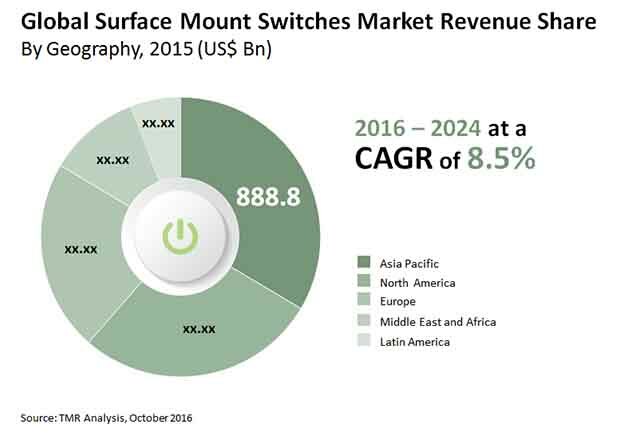 As per the research report by Transparency Market Research, in 2015, the global market for surface mount switch was worth US$2650.0 mn. The market is estimated to reach a value of US$5860.0 mn by the end of 2024, registering a strong 8.50% CAGR between 2016 and 2024. From a geographical perspective, Asia Pacific held a large share of the global surface mount switch market and is likely to remain dominant throughout the forecast period. A substantial rise in the production activities of electronic products and the robust development of the automotive industry are the important factors predicted to augment the growth of the Asia Pacific market in the coming years. In addition, the rising demand for high speed internet and the enhancement of wireless communication are likely to accelerate the growth of the market in the near future. Furthermore, North America is expected to witness promising growth, thanks to the increasing contribution from the U.S. and the rising government initiatives for the enhancement of the healthcare sector. On the basis of product type, the ultra-miniature surface mount toggle switch segment is expected to lead the global market throughout the forecast period. The high growth of this segment can be attributed to the long-lasting performance it offers in comparison with the ultra-miniature surface mount pushbutton switch. The increasing use of toggle switches as light switches, especially in domestic settings is anticipated to encourage the growth of this segment in the coming years. In addition, the rising demand from diverse applications, such as automated robots, minicomputer panels, and advanced medical equipment is estimated to accelerate the growth of the segment in the coming years. The increasing disposable income of consumers, especially in emerging economies and the increasing consumption of electronic products are the key factors projected to encourage the growth of the global surface mount switch market throughout the forecast period. In addition, the emergence of e-commerce is expected to accelerate the overall development of the market in the coming years. Furthermore, the rising number of mergers and collaborations, along with the expansion of the application base is predicted to contribute towards the growth of the market in the coming years. On the flip side, the unsuitable and comparatively expensive products for mechanical stresses are predicted to restrict the growth of the global surface mount switch market throughout the forecast period. Nevertheless, the increasing investments in the research and development activities and the increasing focus on innovations are projected to accelerate the growth of the market in the near future. Moreover, the development of telecommunication sector is likely to offer growth prospects for the key players operating across the globe.